I just read this article and thought you might want to give it a read, too. 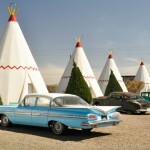 It\'s called Get your kitsch on Route 66: The Mother Road’s best oddball attractions and you can find it here https://www.orbitz.com/blog/2015/05/get-kitsch-route-66-mother-roads-best-oddball-attractions/. Let’s be honest, the great American road trip wouldn’t be so great if our scenic highways and byways were absent of the tacky, wacky and downright bizarre roadside attractions that dominate the landscape. The U.S. is littered with hundreds of such oddities and with gas prices lower relative to last summer, now is the chance to check them out. 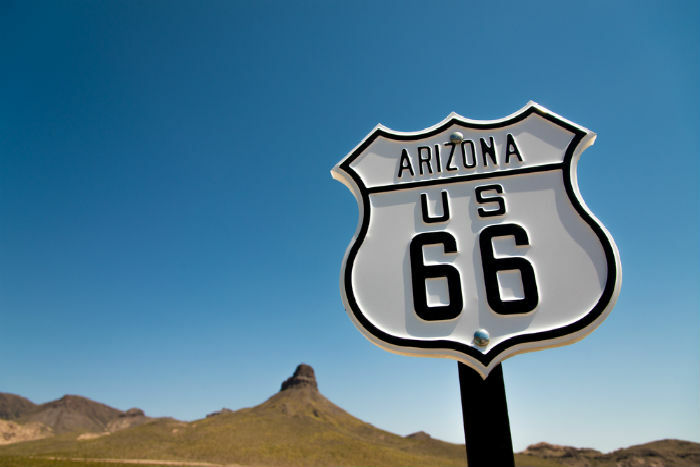 Which U.S. Highway is the king of kitsch? Easy: Old Route 66, of course. 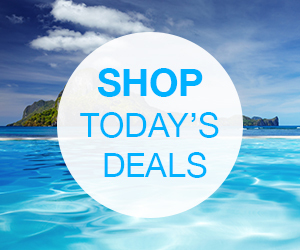 Check out these attractions on or near the Mother Road. 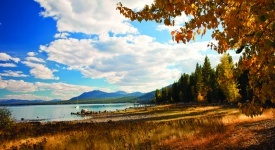 Related: Discover a road trip less traveled on California’s Highway 395. 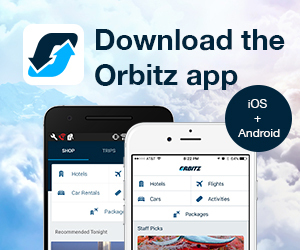 If you’re doing Rte 66 from its true start to finish you’ll begin your journey in Chicago. 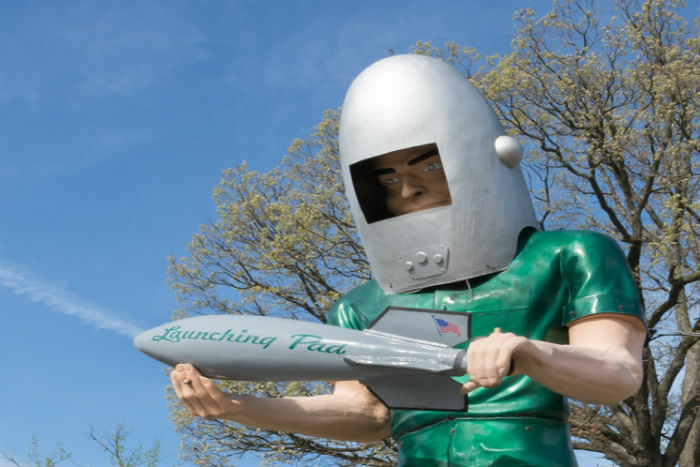 Your first roadside reward comes about an hour later in the small town of Wilmington where you’ll be greeted by the 30-foot tall Gemini Giant, a space age fiberglass sculpture and one of many “Muffler Men” advertisements from the ’60s. He looms large over the Launching Pad drive-in restaurant which, alas, is permanently closed. Rural Route 66 winds through the capital city of Springfield and then bends down toward St. Louis where the Land of Lincoln will once again reward you, this time in the form of the World’s Largest Catsup Bottle, a 170-foot tall water tower built in 1949 and protected by the National Register of Historic Places. The wide open plains of the Show Me State offer unobstructed driving pleasures but don’t forget to pull over about 90 minutes southwest of Saint Louis in the tiny town of Cuba where the historic Fanning Route 66 Outpost has multiple sights to behold including the World’s Largest Rocking Chair, an archery pro shop, complete with target ranges, and plenty of swag for sale at the general store. While Kansas claims bragging rights to a mere 14 miles of Route 66, it does boast an old-time filling station in Galena that was completed in 1934 and is now owned by a quartet of entrepreneurial women (hence the name). The repair garage is a diner and if you’relooking for a photo op, try posing in front of the 1951 boom truck out front on which the character Tow Mater from Pixar’s Cars was based. The Sooner State is full of roadside nuttiness, including this oddball gem located about 22 miles east of Tulsa. 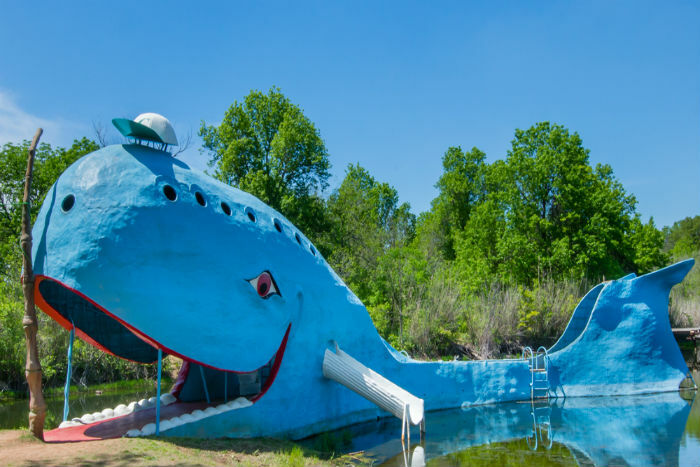 Originally built in 1972 as a gift from Hugh S. Davis to his wife, the giant Blue Whale of Catoosa quickly became a community fixture and remains an integral stop for visitors traversing the Mother Road. This sixty-foot monument in Foyil, Oklahoma has some competition (there are totem poles in Alaska and the Pacific Northwest that are larger), but this towering folk art masterpiece from Ed Galloway is arguably the largest totem pole made of concrete and has been on the National Register of Historic Places since 1999. The flat and dusty plains of the Texas panhandle are punctuated by several Mother Road marvels. The first is the Cross of Our Lord Jesus Christ located on the south side of I-40 (formerly Route 66) at exit 112 in the town of Groom. The 190-foot tall cross can be seen as far as 20 miles away and has at its base life-size statues of the14 Stations of the Cross. 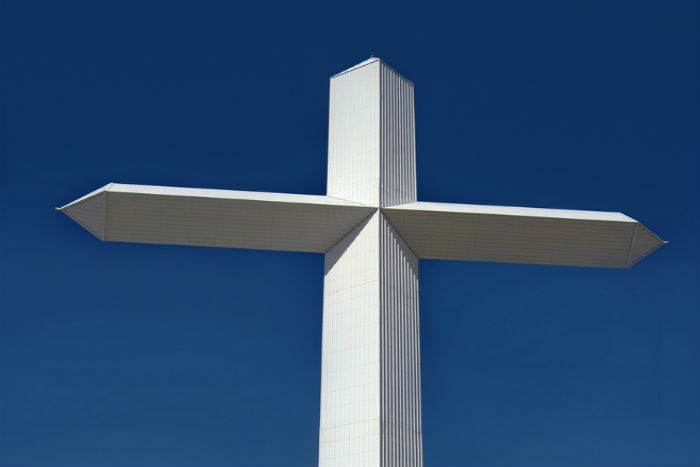 It is the largest free-standing cross in America. You’ve heard of this one, right? 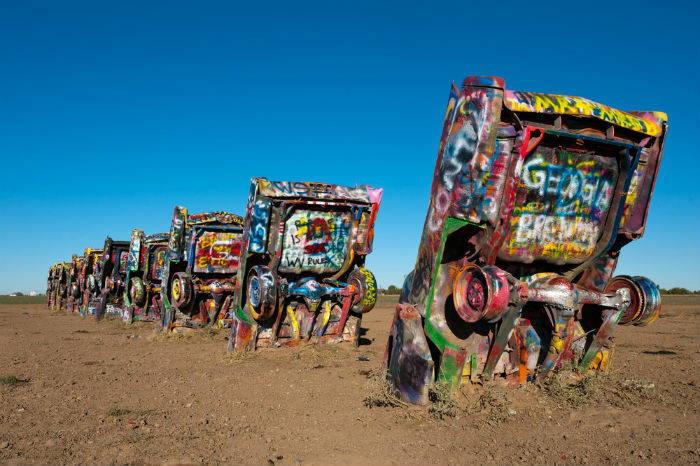 Perhaps the most famous attraction on all of Route 66, this public art installation located just west of Amarillo, Texas has been around since 1974 and consists of the tail fins of ten brightly painted Cadillac cars buried nose down purportedly at the same angle as the Great Pyramid of Giza. Alas, this folk art museum was constructed in 1983—long after Route 66 has met its demise—but it is nevertheless considered an essential 66 stopover. Located outside of Albuquerque, the Tinkertown Museum is a 22-room museum whose walls are crafted of 50,000 glass bottles and whose displays include miniature-wood carved figures and other artifacts of Americana. You kind of have to see it to believe it. 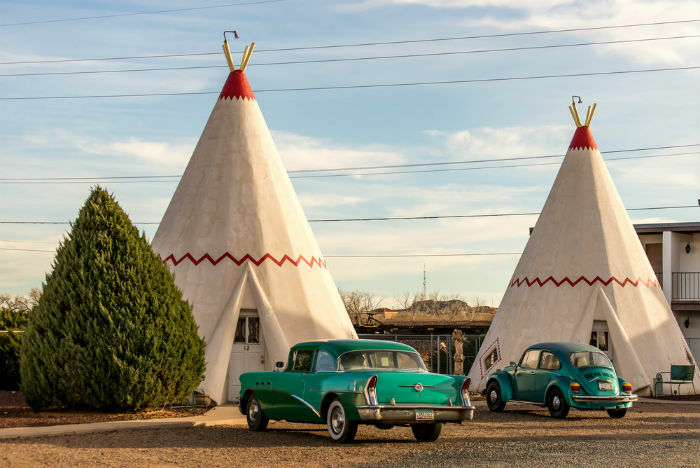 The Wigwam Motel chains built during the 1930s and 40s once had seven locations, but it’s now reduced to three (including Rialto, California and Cave City, Kentucky). Check out (or check in at) the Arizona outpost, which is on the National Register of Historic Places, where visitors have the chance to overnight in a teepee (not a wigwam as the name implies). We love the high kitsch factor and the fact that the main office doubles as a museum. This gargantuan golf ball-shaped house in Yucca, Arizona has quirky origins. It was originally constructed in 1976 as a restaurant to be called the Dinesphere but the developer went bankrupt before it opened. Now a private residence (so don’t try swiping at it with your nine iron), it’s easily viewed from I-40 at exit 25 and is locally referred to as the Arizona Death Star. 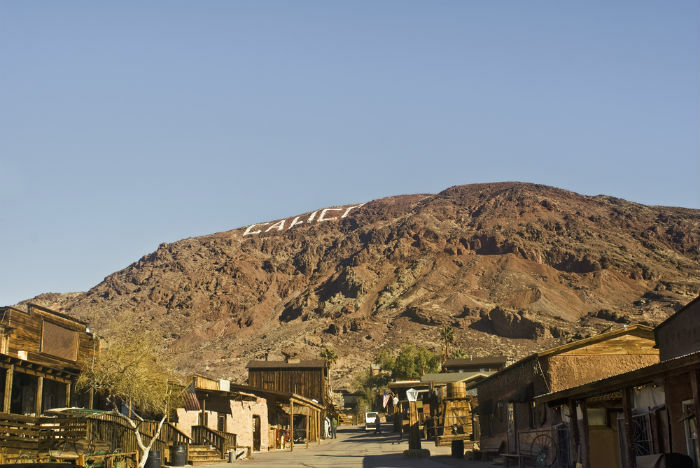 The Golden State welcomes you with a number of interesting diversions including the third Wigwam Motel and Roy’s Motel and Cafe, but don’t missthe kitschy cool Calico Ghost Town, which was purchased after its decline by Walter Knott (of Knott’s Berry Farm) and restored as a pioneer-era attraction complete with actors in period gear and daily gunfights. You can find it about 15 miles north of Barstow. 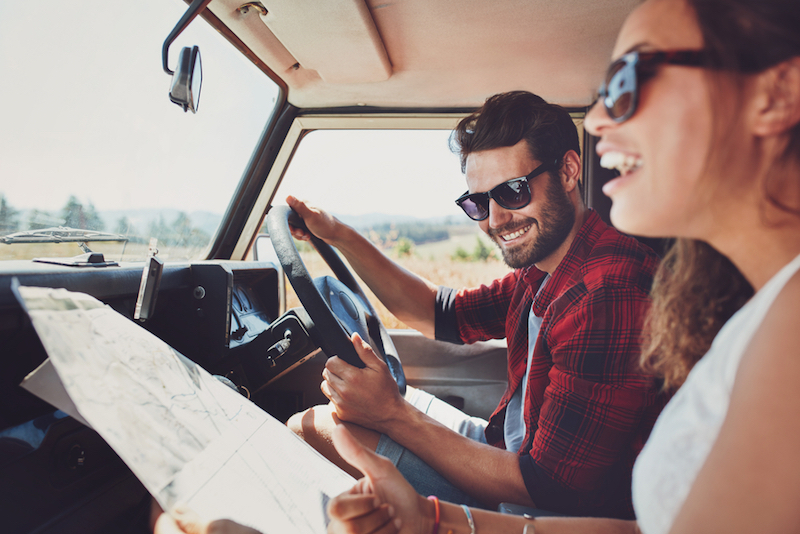 The salt-air breeze of the Pacific Ocean is calling you, but beforeparking your car in the sandy beaches of Santa Monica and celebrating a job well done, stop at the Donut Man in Glendora for an iconic Route 66 snack. Open 24/7, the Donut Man serves up doughnuts filled with seasonal ingredients like strawberry, peach and pumpkin. 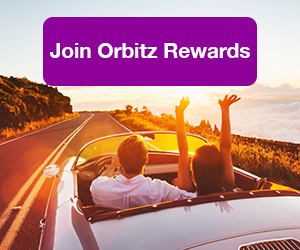 Having completed every mile of Route 66, consider this a well-earned victory lap. There’s also the El Rancho hotel in Gallup, NM. Where each room is named for a classic movie star and the main lodge displays a large collection of signed photos of stars of the past who stayed there back in Hollywood’s golden era. Kitschy and clean. 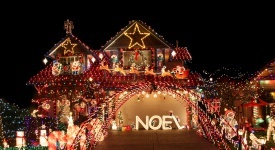 It is funny and but interesting place to visit. 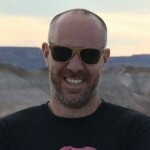 Thank you for unique posting each article i showed on this blog.